I love when I smell the basil from my box before I even see it. Pesto, pesto, pesto! And, I get so darned much basil that there’s plenty for other delicious uses as well. I’ll sprinkle it on a corn & chard flatbread, cook it up with pounds of tomatoes in a fresh tomato sauce, mix it in an asian noodle salad, use it in a starring role in risotto and gazpacho, and finally stir it in as an oh-so flavorful chicken salad addition. Basil galore, plus so much more! Saturday – kids’ choice…sign me up! Sunday – who needs Ragu? Wednesday – my first gazpacho! 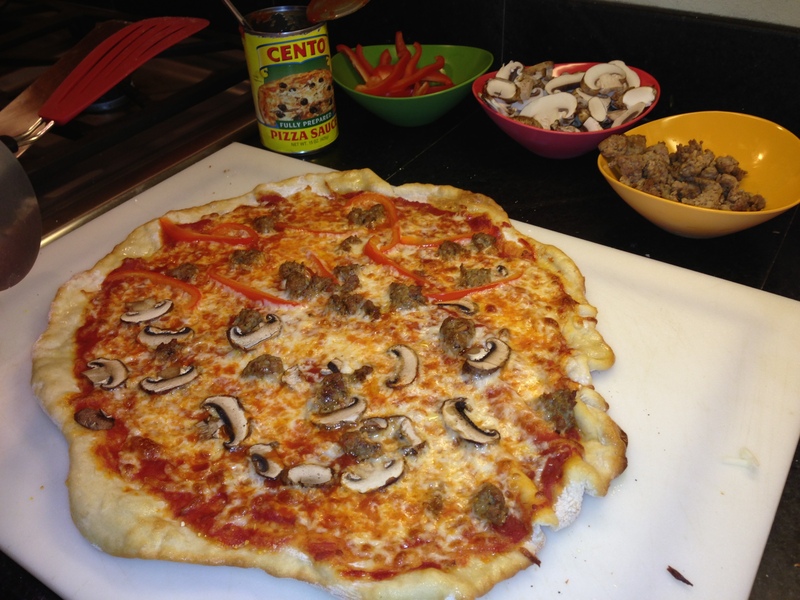 Super fun, interactive, and delicious way to use those veggies –Pizza Night! Let this prior post be your inspiration and step-by-step instructional for pizza making. Instead of leeks, I’ll caramelize some of onions. The images are so striking…”eat your colors” indeed. Make it into whatever shape you’d like, and sprinkle with whatever cheese(s) strike your fancy. Good old fashioned mozzarella would be delicious too (or fontina, or or or…). Use Deb’s dough recipe, my go-to 5 minute recipe from The New Basics, or grab your dough from Hot Lips, New Seasons, or nearly any favorite pizza place. With a couple extra kids for dinner (which happens quite often) and the week’s pile o’ veggies toppling, I asked what was calling their name. This is what we came with. A special Saturday dinner that honestly couldn’t be simpler. First, my go-to pesto recipe…literally five ingredients tossed in the food processor. I don’t even measure the basil, just pack it in. If it looks like a double batch, I double the other ingredients. Pesto is one of those things you can adjust as you go to make it taste just as you like it. Sometimes I add a tablespoon of lemon juice for a little zest. We cook up any shaped pasta, douse it with pesto, give it a good mix until it’s just green enough. When it’s in the serving bowl, I love to just add slices of farm fresh tomatoes to the top; not only gorgeous, but delicious too. This chard salad has earned a coveted place at our dining table, turning into a “most-requested”, which I don’t mind a bit. I adore this Food52 chard salad…the perfect balance of crunchy, garlicky, and zesty. I buy pre-made bakery breadcrumbs, then just sauté those lightly in a little more olive oil and garlic. It’s literally a two minute process. I do not use the full quantity of breadcrumbs suggested, maybe half that amount instead, just enough for a good crunch and flavor throughout the salad. As for the corn, eating it right off the cob, with those cute little corn holders, is a late-summer must. We’re just not sure when the corn frenzy will come to a screeching halt; the tastiest of late summer treats is corn on the barby, grilling it until it’s just lightly golden in places. And for the Saturday finale, despite my plea for something berry, peach, or plum, the kids were insistent on a s’mores pie. Not enough s’mores this summer, they say. Actually, I agree. This “pie” seems really a decadent layering of graham cracker based cookie dough, chocolate, and marshmallows, both in the cream and the whole variety. Yikes…sounds amazing to this s’mores lover! Here’s the tomato sauce recipe I go to again and again. And again. Why? First, because it’s fabulous. It also happens to be quite loose and non-fussy…no worrying about tomato peel or seeds, no pre-sauteeing of ingredients, and no diluting the tomato flavor with other things. It’s fresh tomato and basil, through and through. After cooking the very minimal ingredients for a half an hour or so, the final consistency is up to you. Whirl away in the blender or food processor for very smooth, pulse a few times for saucy but with some texture, or don’t use a machine at all and just mash up with the back of a wooden spoon, keeping lots of chunks intact. This sauce freezes nicely – use it all winter for pastas, polenta, pot roasts, whatever. We can’t wait though, so will delve in immediately, served over spaghetti with lots of grated parmesan. I’ll make a simple salad made with my gorgeous gourmet greens sprinkled lightly with tasty olive oil, vinegar, salt and pepper. And for anyone missing the meat, a great (and near-zero effort) accompaniment would be some Italian sausages grilled up on the BBQ. Deborah Madison’s brilliance, once again. Generally, an Asian noodle salad is something everyone gets excited about. The soy/sesame oil based dressing is generally the clincher, and can be tweaked with anything from ginger to spicy oils to vinegar to peanut butter. This version has a little of everything. I’ll use a big bunch of chives from the herb pot in place of the green onions. The asian eggplant seems to be the star in this pasta salad – just the flesh is used, and soaked in the ultra-flavorful dressing. I’m just certain I’ll use more than the one called for in the recipe. The rest of the veggies will be impromptu – I’ll skip the snow peas and sprouts, using slivered carrots and zucchini, and thinly sliced cucumber, instead. Depending on the veggies you choose, they can either be blanched slightly, or just added in before the final mixing for a nice crunch and a really pretty salad for supper. Believe it or not, I had no cilantro, so opted for slivered basil instead. Serve with a big bowl salted, packed-with-protein, edamame. I tend to forget about risotto during the summer months, maybe because of the stovetop time often required to get a just-right consistency. But, after seeing a version of this oh-so seasonal risotto on the Paley’s Place menu recently (darn, I was just there for fries and a cocktail! ), I was questioning why I didn’t place it in my summertime repertoire! It really amounts to less than half an hour. I’ll use lots of my farm fresh corn, onions, tomatoes (of any kind!) and basil. The tomatoes and basil get combined sort of salad-like, then mixed in at the end to keep the tomatoes intact. Grill some fresh Pacific Northwest salmon, and your meal is complete. Just lightly brush with olive oil, a squeeze of lemon juice, and a sprinkling of fresh herbs after cooking. I’m not sure it why it just hit me this summer. The fact that I’ve never actually made gazpacho. It’s high time, I’ve decided. As I’d heard rumored, if you follow the right recipe and don’t get fussy about tomato peels, etc., it’s a snap to make. All the ingredients, straight into the blender or food processor. Done! In this Mark Bittman recipe, he fusses over nothing, tossing the whole veggies in the processor. Use day-old, crustless bread, and salt to taste. I’ll add some grilled zucchini to the dinner as well. With just olive oil, salt and pepper, it’s a hit every time! I often attempt to cut it long-ways (with mixed success – hard to get those slices uniform thickness!) for less labor-intensive flipping, less falling through the grill, and a really pretty presentation! The Cooking Light suggestions to fancy it up are nice; I also sometimes drizzle a bit of good balsamic vinegar after cooking. Grab a pre-roasted chicken from your favorite market, and this is a no-cook, full meal deal. This chicken salad is a no-frills, relatively healthy version, that uses a big bunch of my fresh celery and chicken left from last night. I would double this recipe for four people. I’ll use at least that much chopped celery, and I’ll use some of my red onion instead of scallion, as well as chives from the pot. With just enough mayo (you could probably skip this and up the yogurt ante), plain yogurt, and lemon juice to moisten nicely, you can then season the dressing with any herbs that sound tasty – basil, tarragon, parsley, etc. I’m doing mine sandwich style, with some good, hearty, whole-grain bread. Thinly sliced cucumber and lettuce leaves would be delicious fillings. For a side salad, this beauty from the chef at Ned Ludd – it works very nicely to skip all the fancy steps, and just whirl the olive oil, salt, lemon juice, and basil all together in a mini food processor for the dressing. No separate steps, just pour it over your simple salad of lettuce, cucumbers, and goat cheese (or whatever cheese…); I keep thinking kalamata olives would go nicely in here too.